The neoStat’s Smart Thermostats have been designed to be slim & stylish, with three stunning colours available. neoStat’s are just a little bigger than a standard light switch, so you will notice what it does rather than where it is. The neoStat’s can be controlled from anywhere thanks to the plug and play neoHub. 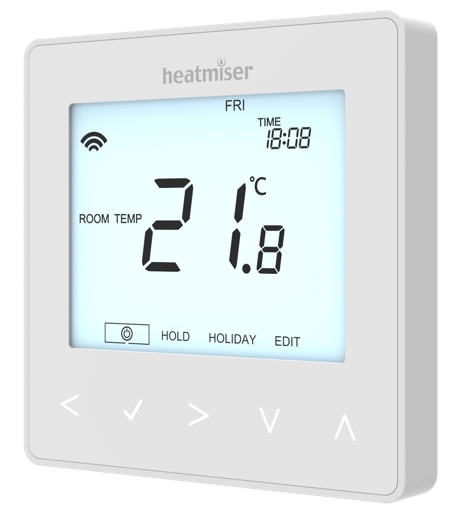 The Heatmiser neoStat is 230v powered and is the ideal upgrade route for those with an existing mains powered thermostat. neoStat can operate in Timer or Heating Mode and can be used with remote sensors. The Heatmiser neoStat-e is our electric floor heating model, capable of switching up to 16A. A 3M remote floor sensor is provided and the neoStat-e can be used alongside all other neoStat models on the same system. The Heatmiser neoStat-hw is a time clock with changeover contacts. It is designed for those with a motorised valve that requires power to open and power to close. The neoStat is 12v powered and is the ideal upgrade route for those wanting app control and that have existing low voltage cabling installed. neoStat 12v are compatible with our 12v Wiring Centre UH1. The neoAir is ideal for those looking for a totally wire free App controllable solution of your heating & hot water. Both the UH8-RF and RF Switch receivers are compatible with the neoAir. neoStat and neoAir communicate wirelessly to the neoHub to offer a reliable and scalable network system. The mains powered neoStat automatically repeats the data signal from other neoStat/neoAir in the home. If there are no neoStat’s installed, the neoAir communicates directly with the neoHub and so the neoPlug or Boost can be used to extend the communication distance. The neoStat/neoAir series offer an easy to navigate programming system, providing all of the options across the bottom of the back lit display. The neoStat & neoAir are perfect for the new build & retrofit market. Whereas the neoStat is mains powered, the neoAir is battery powered and so is ideal for extensions or where mains cable hasn’t been installed for the thermostat. Self Learning Preheat calculates the amount of heat up time required to ensure your home is warm when you wake and return home. This is automatically optimised throughout the year to save you money and will automatically detect any changes in your home that causes the preheat time to change. Temperature Hold Facility allows you to hold a set temperature for a specific duration – ideal for parties. After which, the thermostat will revert back to the programmed setting. Key locking is standard on all of the Neo Series and is an excellent way to reduce tampering of the heating system.